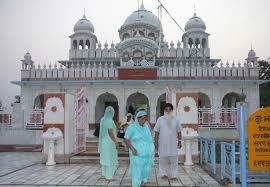 Here is Some Information about Gurudwara Mata Sundri Ji New Delhi India. The Gurudwara Mata Sundri ji is a historical Gurudwara in Delhi.The Gurudwara Mata Sundri ji is located Connaught Place near near the JP Nayak Hospital New Delhi.Gurudwara Mata Sundri Ji Dedicated to Mata Sundri Ji as a wife of Guru Gobind Singh ji.The Gurudwara Built in the memory of Mata Sundari and Mata Sahib Kaur, the two wives of Guru Gobind Singh. The Gurudwara has been built beautifully. 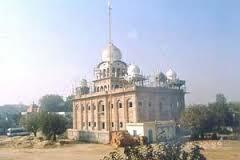 The Gurudwara is the site where Mata Sundri stayed since 1727 for the rest of her life. The Gurudwara was earlier known as Mata Sundri’s Haveli.The Gurudwara is surrounded by beautiful gardens and well-kept lawns. The sanctum gives a soothing and serene feeling. The Guru Granth Sahib is kept on an elevated platform. The Darbar Sahib is encircled with a railing giving it a look of a throne. There is also a donation box right in front of the Darbar Sahib. The entire structure is constructed from marble stone. The entire sanctum is carpeted which makes it comfortable for visitors to sit and absorb the sanctity of the Gurudwara. Walking around the Gurudwara visitors can see special items belonging to Mata Sundri. There is a pair of slippers used by Mata Sundri that have been framed and put on display. 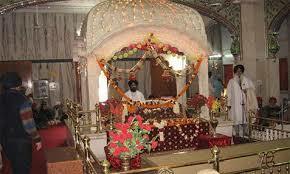 One can also see the swords and other weapons that Guru Gobind Singh had given to Mata Sundri and Mata Sahib Kaur. The Gurudwara celebrates all the Sikh festivals with full enthusiasm. The day of martyrdom of Guru Gobind Singh is observed with full respect at the Gurudwara. People gather from early morning and follow various rituals including akhand path, ardass, kirtans and chanting hymns in praise of the guru. People from near and far come to visit the Gurudwara. The shrine is open for people of all castes and religions and anyone is free to come to the Gurudwara at any time of the day. The interior of the shrine is quite peaceful and people love to spend some peaceful time in the Gurudwara. Visitors can sit in the Gurudwara for as long as they want and pray, meditate or listen to the kirtans and hymns that are recited in the Gurudwara. Mata Sundari ji was wife of Guru Gobind Singh (1666-1708), was the daughter of Bhai Ram Saran, a Kumarav Khatri of Bijvara, in present-day Hoshiarpur district of the Punjab. She was married to Guru Gobind Singh at Anandpur on 4 April 1684. On 26 January 1687, at Paonta, she gave birth to Sahibzada Ajit Singh, the eldest son of Guru Gobind Singh. Consequent upon the evacuation of Anandpur on the night of i6 December 1705, Mata Sundari, along with Mata Sahib Devan, was escorted by Bhai Mani Singh to Delhi. She rejoined Guru Gobind Singh in 1706 at Talvandi Sabo, where she heard the news of the martyrdom of her son and the other Sahibzadas as also of the death of her aged mother-in-law, Mata Gujari. She went back to stay at Delhi while Guru Gobind Singh left Talvandi Sabo for the South. At Delhi, Mata Sundari adopted a young boy whom she named Ajit Singh because of his resemblance to her own late son. After the passing away of Guru Gobind Singh at Nanded in October 1708, the Sikhs looked up to her for guidance. She appointed Bhai Mani Singh to manage the sacred shrines at Amritsar and also commissioned him to collect the writings of Guru Gobind Singh. She also issued under her own seal and authority hukamnamas to sangats. The hukamnamas since discovered and published bear dates between 12 October 1717 and 10 August 1730. Mata Sundari was disappointed in her adopted son, Ajit Singh. Emperor Bahadur Shah treated him as the successor of Guru Gobind Singh, called him to his court and gave him a robe of honour in September 1710. This went to his head and he started 1iving in style as a courtier. He grew arrogant and haughty even towards Mata Sundari who disowned him, and migrated to Mathura. Ajit Singh was later convicted for murder and was put to death on 18 January 1725. Mata Sundari returned to live in Delhi where she ,died in 1747. A memorial in her honour stands in the compound of Gurdwara Bala Sahib, New Delhi. The Gurudwara is built from lime mortar and brick and the interior flooring is marble. At the end of the hall is a beautiful gallery with marble flooring. The beam in the gallery is carved with Gurmukhi script. There is a slab in the center made of marble which carries the Sikh religious symbols. The architecture of the Gurudwara is traditional. On arriving inside the Gurudwara, visitors walk up a small gallery that leads to a staircase which further takes visitors to the main Darbar Hall. The Gurudwara is well-maintained and is quite neat. The roof has domes typical to the Sikh style of architecture. The dome sits on top of rectangular structures. By Road : There are many public and private vehecals available to reach Gurudwara Mata Sundri Ji New Delhi.You can easily reach Delhi by road at any point of time. It is adequately connected with adjoining states and cities by extensive road network. By Metro : The Nearest Metro station is Barakhamba metro station. By Rail : The Nearest Railway station is New Delhi railway station. By Air : The Nearest Airport Indira Gandhi International Airport Delhi.